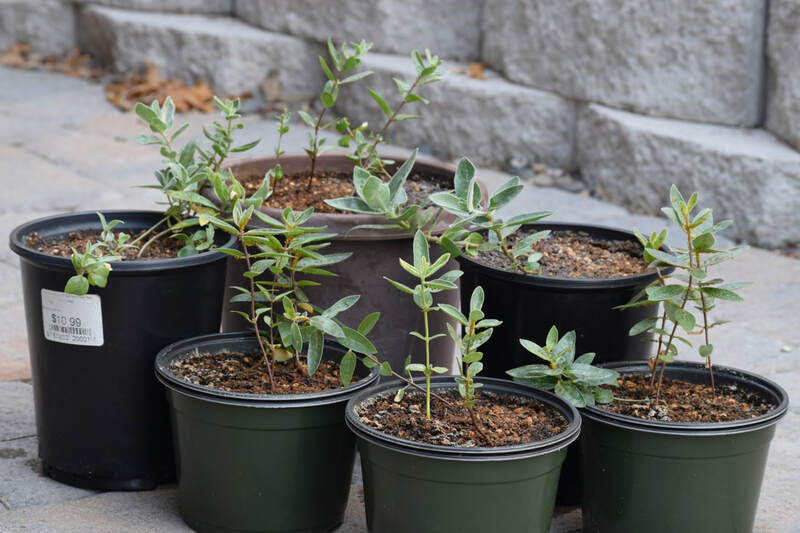 *This blog post contains affiliate links to Amazon products that may help you germinate and grow milkweed plants. In this test seeds of Asclepias speciosa (showy milkweed) were used. The seeds were collected in the fall of 2017. Under normal conditions the seeds would have fell to the ground in September. Their tough exterior would have been exposed to the weather during the winter. Snow and rain would have stratified the seed and prepared them to grow in the late spring. The seeds being tested have not lived a normal life. 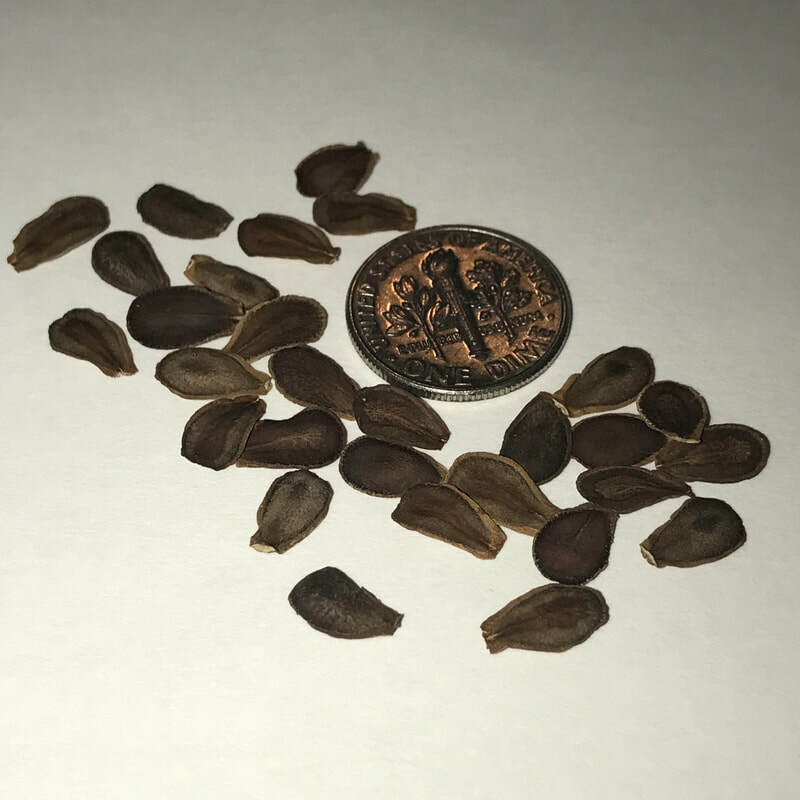 These seeds were collected from ripe opening pods on top of milkweed plants that were beginning to go dormant after a long hot summer. After being collected they were separated from their seed pod and the milkweed silk that could have carried them thru the air. The seeds are dried for a few weeks in the open air and then stored in open bags indoors. To be fair, nature does a pretty good job. Milkweed has been growing for thousands of years without any human intervention. On the other hand, one milkweed plant can cast out thousands of seeds and only a tiny fraction of those seeds will find the right conditions to grow. Milkweed seeds do benefit from Cold Moist Stratification which can be simulated in the refrigerator. It takes time to cold moist stratify milkweed seeds and may not be necessary. What if there is a faster way that works? 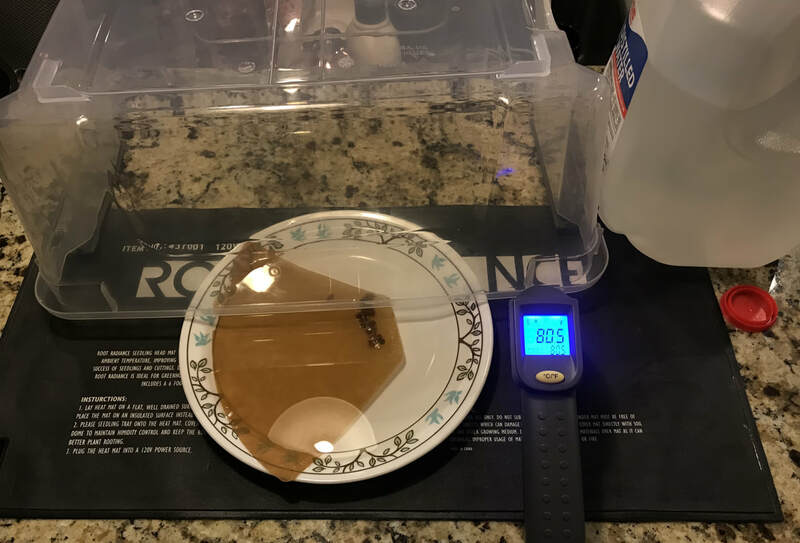 2/10/18 12:00 68° 26 seeds placed in coffee filter and placed on plate. Poured dechlorinated water into plate to submerge seeds and wet filter. 2/10/18 21:00 68° drained water off plate. Added fresh dechlorinated water. 2/11/18 09:00 66° drained water off plate. Added fresh dechlorinated water. 2/13/18 13:00 drained water off plate. Two seeds are showing growth. Added water. Placed plate on heating mat. 2/15/18 10:00 Five days since test began. Exactly 50% of showy milkweed seeds have germinated. 13 growing 13 not growing. 2/16/18 00:45 added water to plate. Dome created higher temp which evaporated most of the water. 2/16/18 13:00 drained water. Added water. Placed plate on heat mat. Added dome over everything. 2/17/18 01:30 drained water. Added water. Placed plate on heat mat and covered with dome. 2/17/18 07:00 test complete. 21 of 26 seeds are growing in only seven days. Water germination of showy milkweed seeds worked very well. 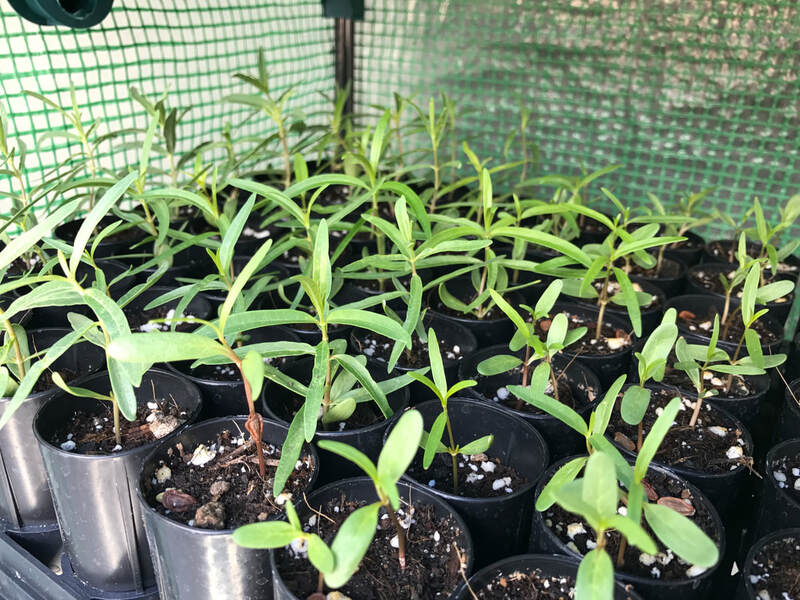 80% of the showy milkweed seeds germinated in seven days. I am repeating the test with common milkweed seeds. When you ask the internet "how to grow common milkweed?" 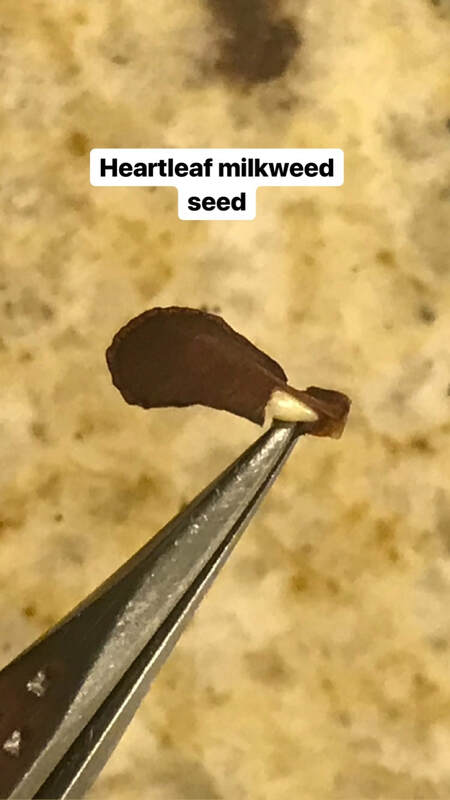 you will almost always be provided directions to Cold Moist Stratification of Milkweed Seeds. Does it work? Yes. Is there a faster way that works? Lets find out. Day one requires an initial setup. Place the seedling warming mat on a table and plug it in. Set a plate on the seedling warming mat. Hopefully the day before this you have left water out for twenty four hours so it is now dechlorinated water. Pour the water into the plate. Place the milkweed seeds in the coffee filter. Set the coffee filter on the plate so the seeds are completely submerged in water. Water temperature should be 75 to 85 degrees. Clipping the milkweed seed will speed up water germination. 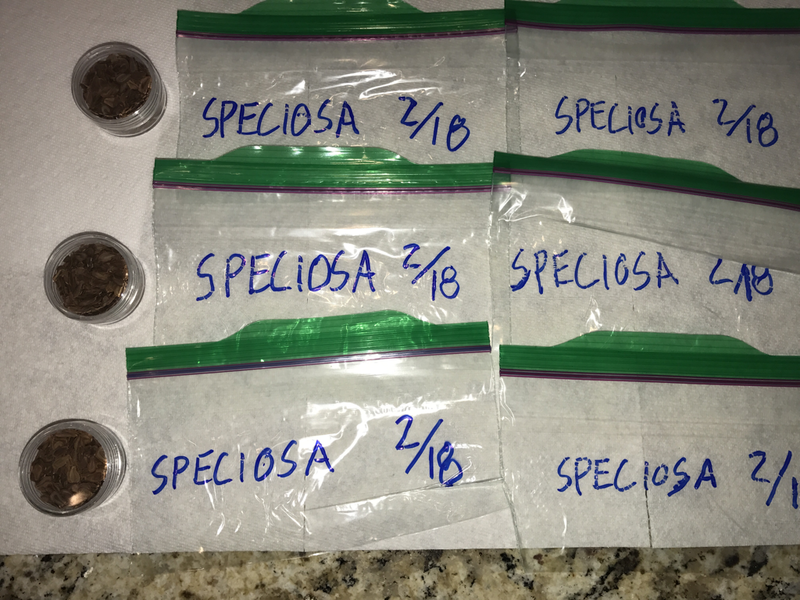 The seeds can be clipped before going in the water but I like to wait twelve to thirty six hours before clipping the seeds. Letting them absorb some water in the first day makes them softer and easier to clip. Water change twice per day. Two of the twenty six seeds have root beginning to show from the seed. At day four there were ten seeds beginning to grow. 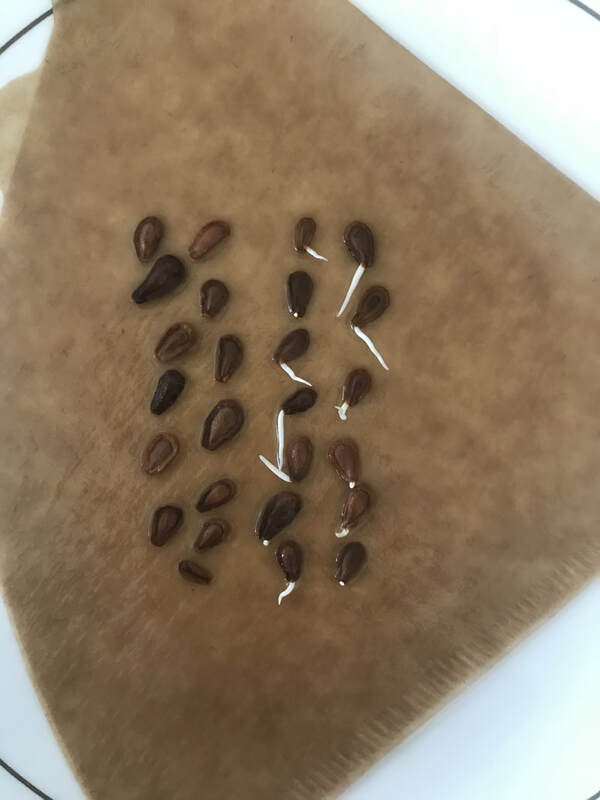 Sixteen seeds are not showing any signs of germination. At this point I was still expecting more of the seeds to grow over the next few days. That did not occur. All the growth began in fewer then five days. The best thing to do with the common milkweed seeds that are not growing is to place them into cold moist stratification. The test continued to day seven. 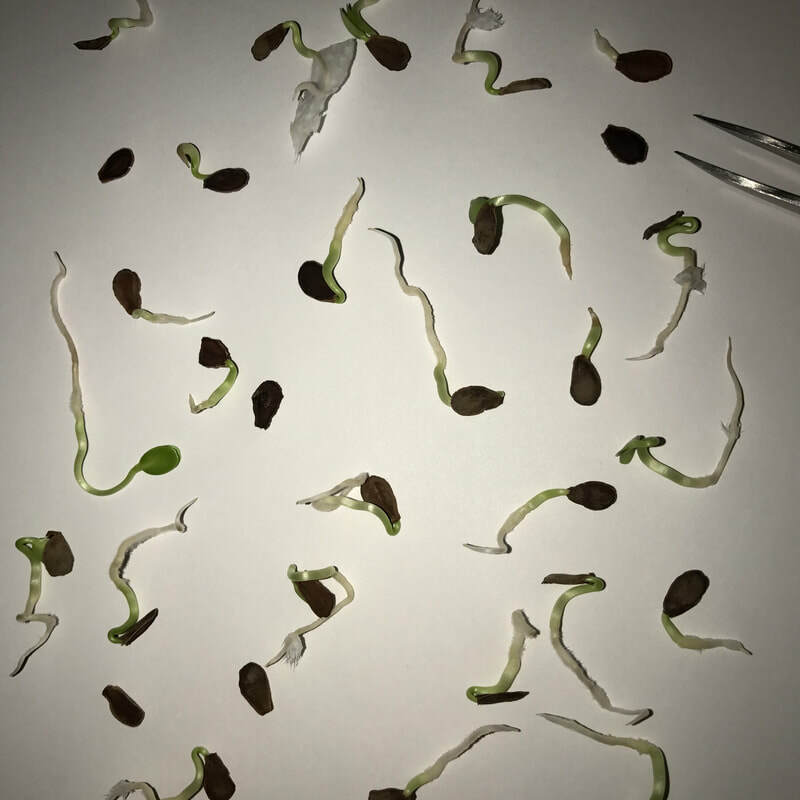 The length of the seeds roots increased but the ungerminated seeds did not germinate. 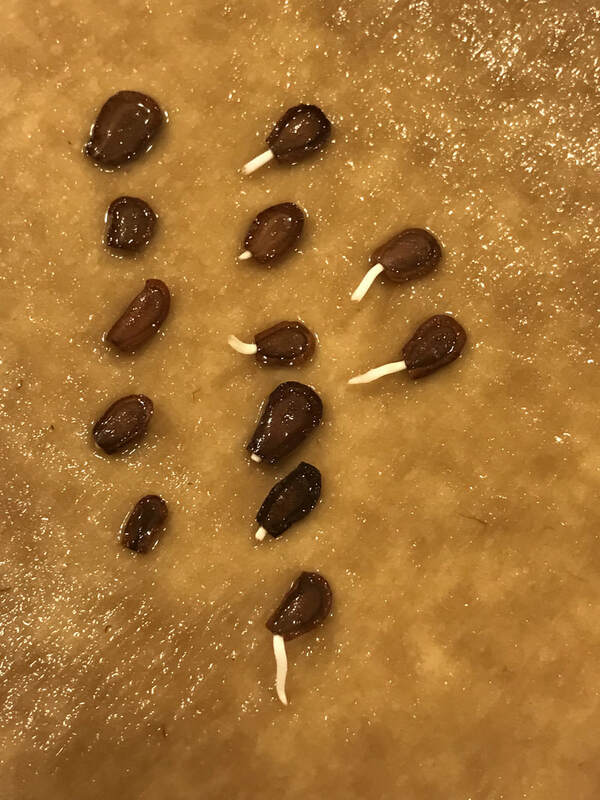 The method is effective in germinating common milkweed seeds. Only some of the viable seeds seem ready to grow. 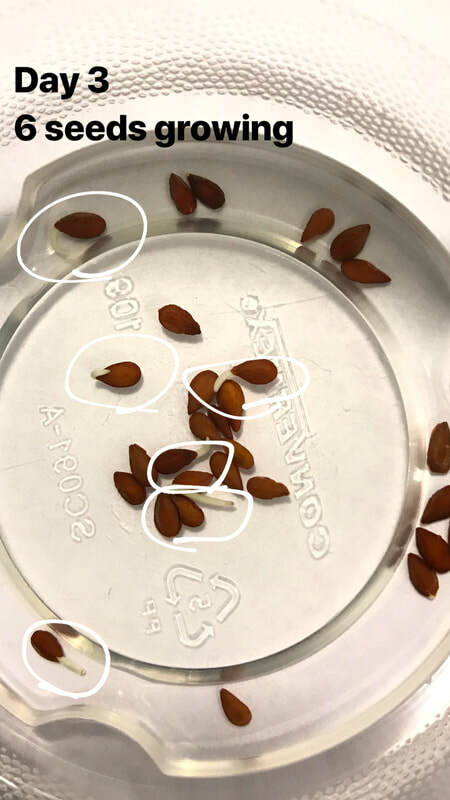 I would like to guess then cold moist stratification prior to water germination could increase the germination rates of the common milkweed seed. 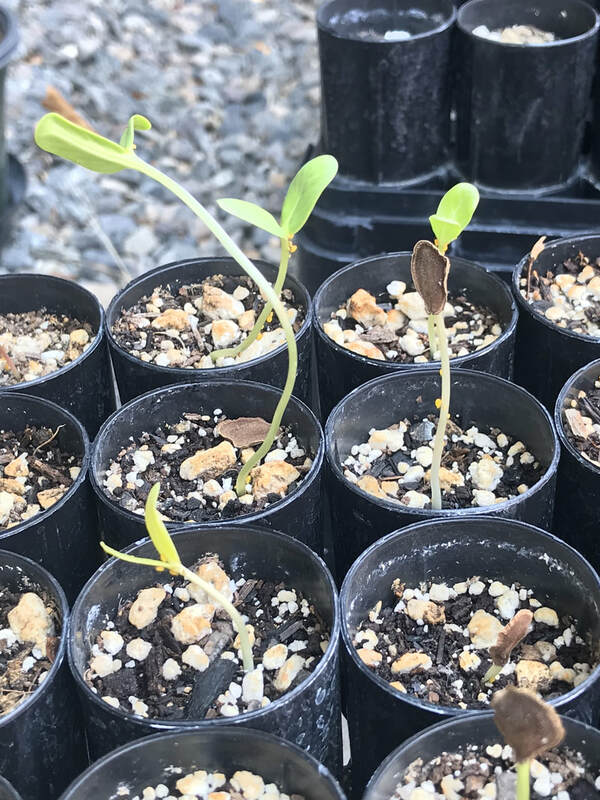 The whorled milkweed seeds I am working with this week have a verified germination rate of 93%. The goal is to start these seeds growing in less then a week. The test began with thirty whorled milkweed seeds. Seeds were dropped into a clear plastic cup. Dechlorinated water was poured into the cup to a depth of 1 centimeter. The cup was placed on a seedling warming mat. The water was drained from the cup and replenished twice each day. At the end of the third day there were two seeds germinating. Continue to drain and replenish the water twice per day. At day four there are a total of six seeds germinating in the bottom of the cup. The cup has always been siting on top of the *seedling warming mat. Testing of whorled milkweed continued until seven days elapsed. At day seven the seeds were removed from the cup of water, untangled, and counted. The results were extremely rewarding. Seventeen seeds are growing and thirteen seeds did not grow. The germination rate is 56% in only seven days. While the germination rate did not reach the ideal number of 93% the results are considered successful. 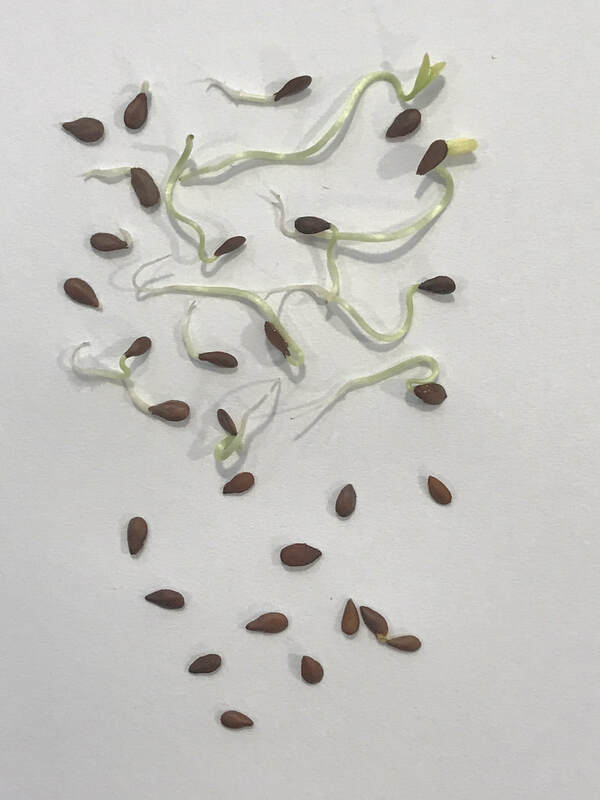 In addition to the number of seeds that germinated I was very surprised to see how long the roots had grown and how vigorous the seedlings appeared to be. When the outdoor weather becomes suitable for growing I will plan to water germinate many more whorled milkweed seeds. This test began with thirty mexican whorled milkweed seeds. The seeds were placed in a cup and water is added to one centimeter in depth. Twice each day the water was drained and replenished. 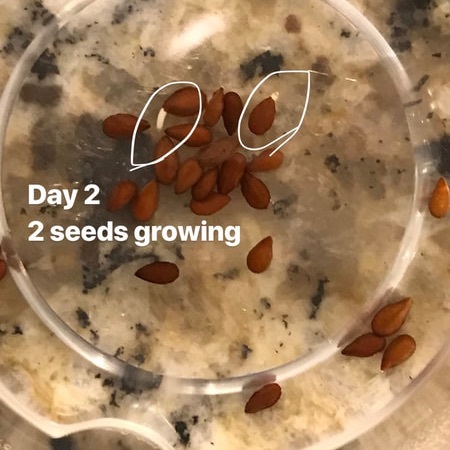 At day two there was one seed growing and twenty nine were not. At four days there were seven seeds growing and twenty three were not. The test continued for a total of six days. At the end of day six there were seven seeds germinated. The test concluded. The germination rate in water of the initial thirty seeds was 23%. Seven seeds grew and twenty three seeds did not germinate. The seeds that did sprout grew very long and healthy looking roots. I decided to plant the roots in a bit of soil. The outdoor temperature is not conducive to growing milkweed seedlings in March. I have placed the plants in soil in a red solo cup with drainage holes. They remain on the seedling warming mat on my kitchen counter. I'll try to provide an update as far as if they survive or die. I'm not very optimistic because I continue to have problems growing mexican whorled milkweed despite how well it seems to grow all around me. Obviously it would be nice to seed all three seeds sprout. It just takes a little more time. 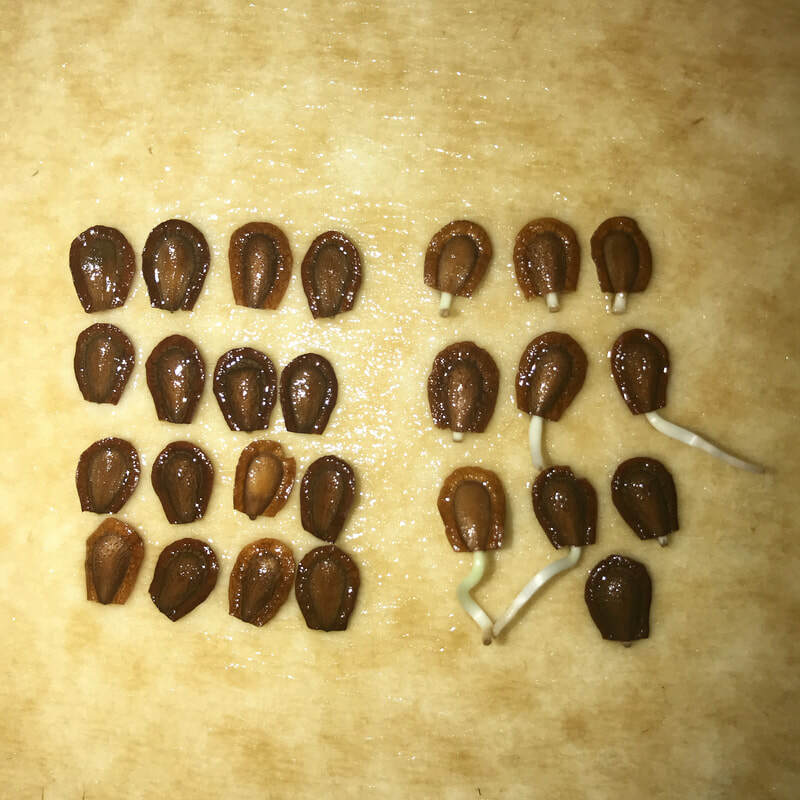 At just under three days (70 hours) all three seeds have sprouted. This is when the fun begins. These Milkweed tree seeds have made me feel like a real green thumb gardener. I should say that sprouting seeds in November isn't the best time of year because the sun is low in the sky and the outdoor temperature frequently drops below freezing here in northern Nevada. The Milkweed tree is a tropical and sub tropical plant so it will never live year round in its current location. Fortunately it can be grown in containers and that is the next step. A wonderful advantage of starting seeds by water germination is how easy it it to plant the seeds. All I did was clean a container that previously has annual flowers that had perished in the recent freezes. I added a soilless base in the container to assist in facilitating the capillary action to wick water from the built in saucer. In the bottom of the planter I used a Coco Coir Brick. Then I added FoxFarm Strawberry Fields Potting Soil. Here is the great part. Planting is as easy as dumping the seeds right from the cup into the soil. All I did now was pour out the seeds and water onto the surface of the soil. I was careful to move the cup while pouring. I wanted the seeds to have separation. A simple circular motion was all that it took. 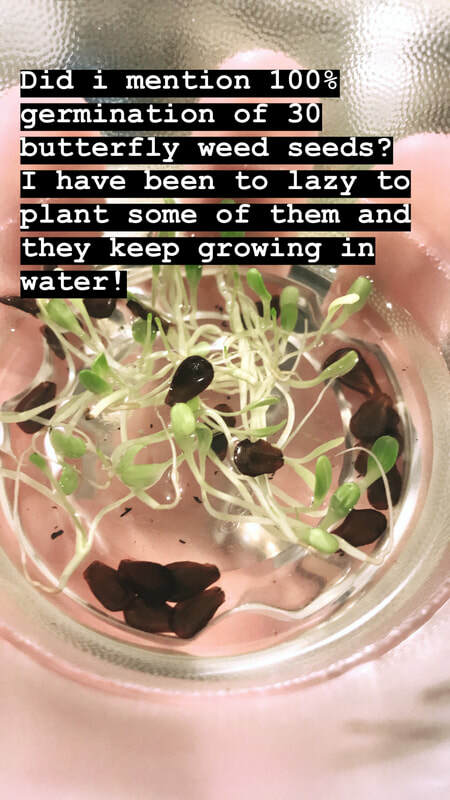 One of the seeds didn't immediately pour out so I added more water to the cup and poured the last seed onto the soil a few inches away from the other two seeds. I've been keeping the planter on the seed warming mat and adding water to the planters saucer. Today is day nine since the seeds started. Seeds have been in the soil for six days. All three seeds were only lightly settled in the soil. They have now pushed their way above the soil. Based on my germination combined with Jessalyn's germination results. The seeds are at 96% germination. 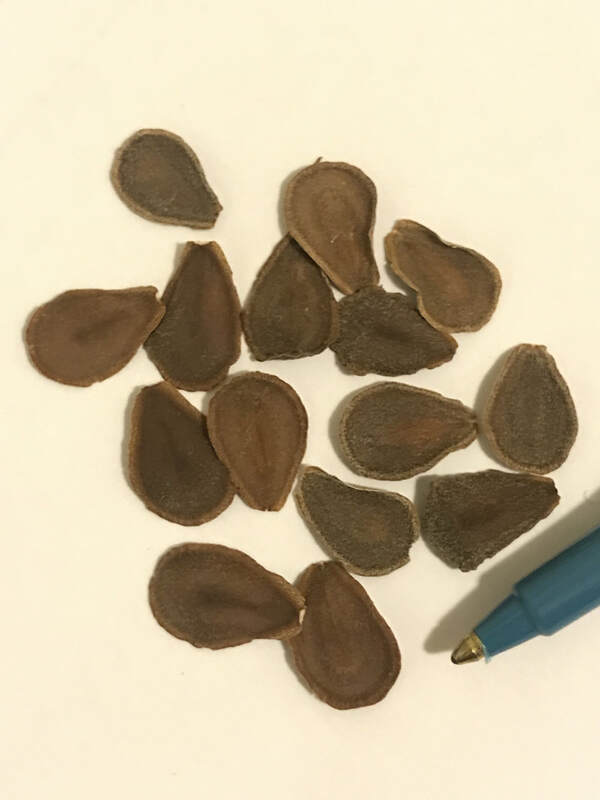 These Milkweed tree seeds are available for sale. The seeds are from the Milkweed tree grown at The Butterfly Garden at Oleander Acres RV Resort. 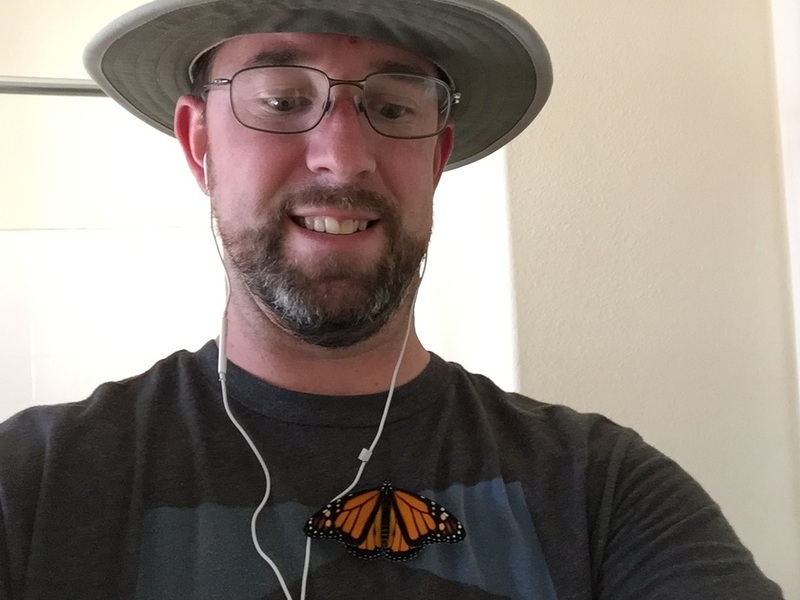 To hear about my visit to the Rio Grande Valley you can listen to the podcast episode titled Milkweed Butterflies of the Rio Grande Valley. Thirty butterfly weed seeds placed in a cup of shallow water. Placed cup on seedling warming mat. Water changed with fresh water after twelve hours. Water changed with fresh water twice on day two. Water changed with fresh water twice on day three. Durring the second water change twenty seven of the thirty seeds were growing. At the beginning of day five all thirty seeds were growing. 100% germination of thirty seeds in five days. WOW! Water germination of butterfly weed worked great. I've never seen 100% germination before. Results are not typical. These seeds in the test are no longer available but they were great while they lasted. Plants from these seeds are growing in my garden. When they produce seeds I'll make them available on this site. 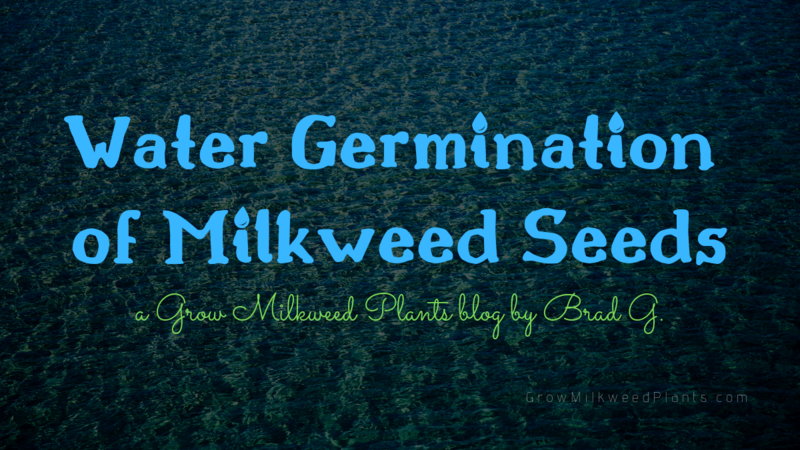 Thirty Sand milkweed seeds placed in a cup of shallow water. Placed cup on seedling warming mat. Water changed with fresh water after twelve hours. Water changed every twelve hours for five days. At the beginning of the fifth day six seed were growing. Water changed with fresh water every twelve hours. On the beginning of day eight ten seeds were growing. The ten growing seeds were planted. Water changed with fresh water every twelve hours. The water germination test concluded on day eleven. Eleven seeds grew. Eleven of thirty sand milkweed seeds grew. The germination rate is 36%. 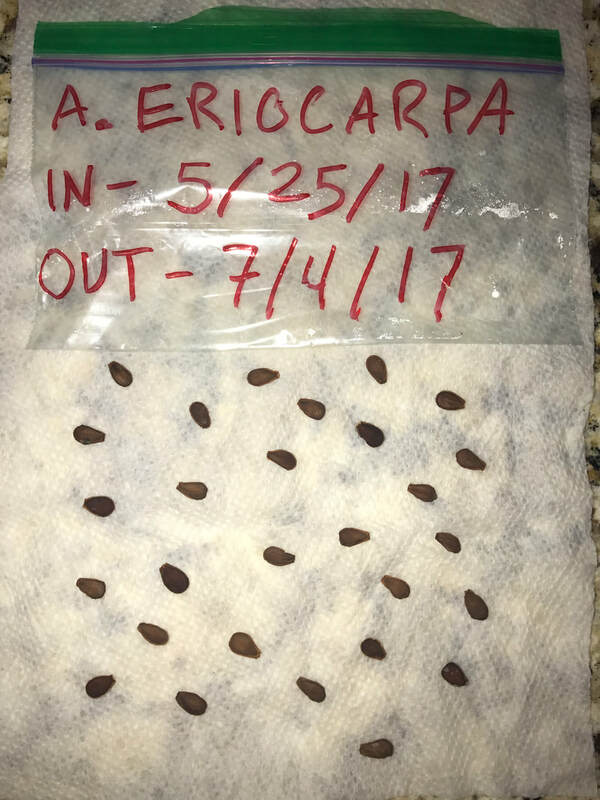 The seeds were from Prairie Moon Nursery and they told me the germination rate of these seeds was 25%. Therefore water germination of sand milkweed appears to work better then whatever method was used in their germination test. Thirty Heartleaf milkweed seeds placed in a cup of shallow water. Placed cup on seedling warming mat. Water changed with fresh water after twelve hours. Water changed every twelve hours for nine days. 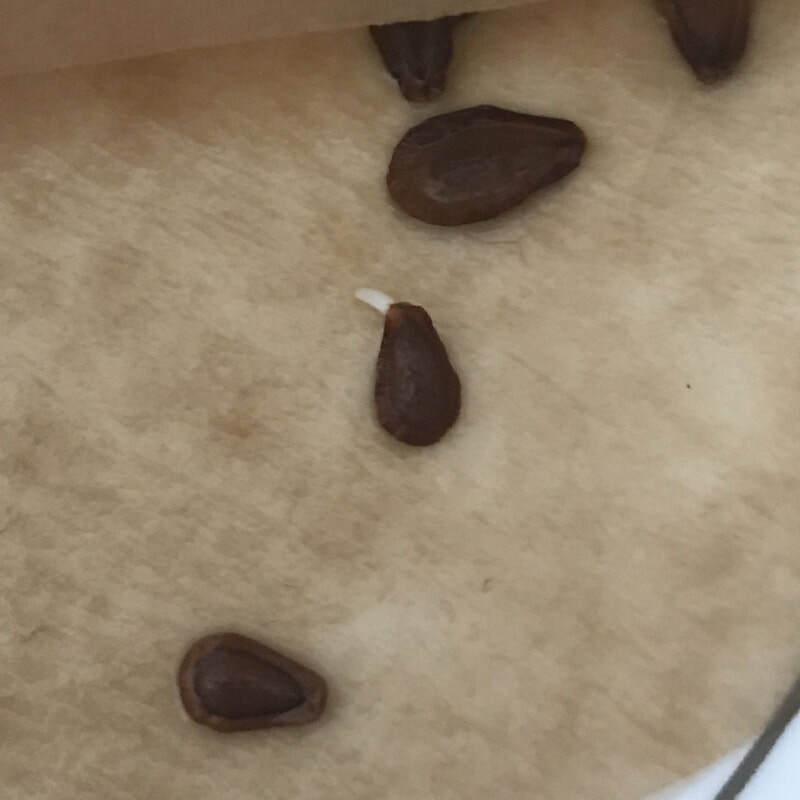 On day five i scraped the tip of five seeds with a sharp knife to remove part of the seeds exterior near where the root radical grows from. On day nine I clipped the tip of the other twenty five seeds with tweezers. Highly successful! Water germination of these desert milkweed seeds was very quick and easy. The seeds began sprouting on the second day and all fourteen of the seeds that grew were growing by day three. One seeds didn't grow at all. The sample size was small only fifteen seeds. 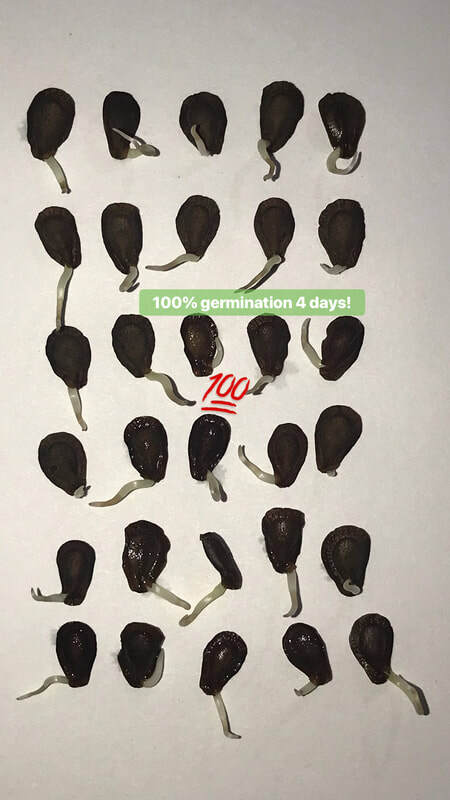 Overall I got 93% germination. After getting sprouts in three days I continued the water germination process thru day five. On the fifth day I planted the seeds in soil. I made a video of the process. Be sure to Subscribe, Like and Share the video. Pro tip. Asclepias erosa grows a massive taproot when mature. This allows it to be a great plant thru the dry hot summers in the southwest. 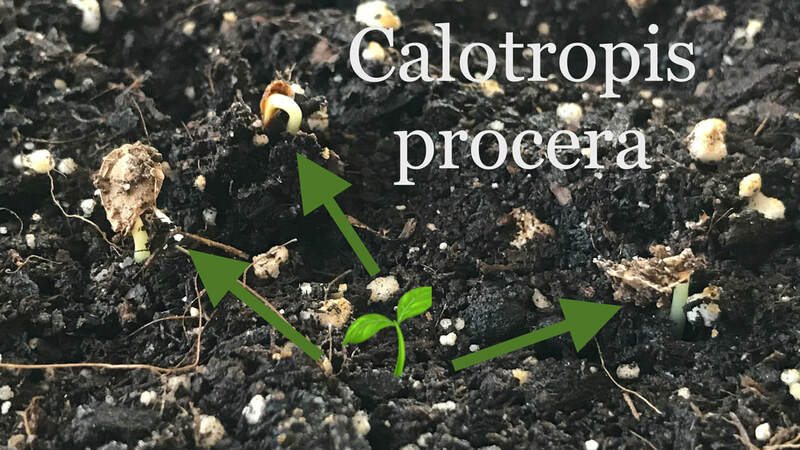 Be aware that the small root is very brittle and a great deal of care needs to be taken while handling and planting the seedling. A broken root can kill the fragile plant. ​Cold Moist Stratification (CMS) describes the process that seeds naturally progress through. 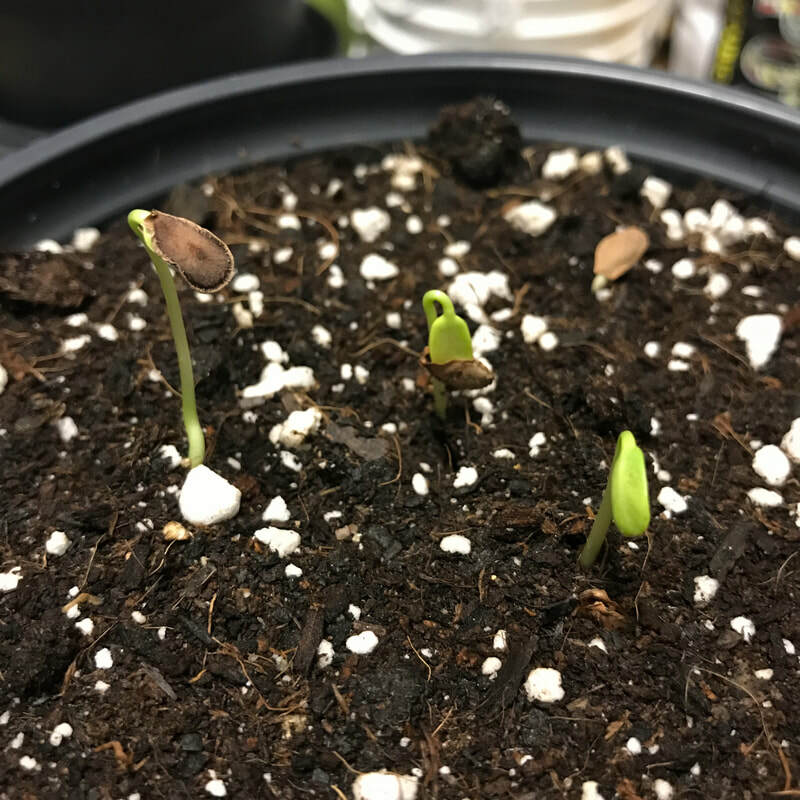 Timing of the process occurs naturally when the seed is dispersed from the milkweed plant in the fall and continues until the seed begins to grow in the spring. 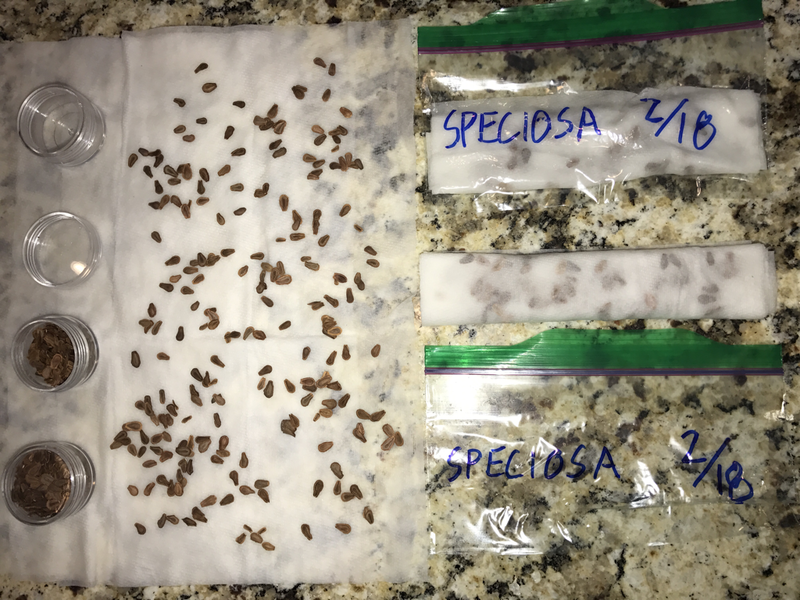 The process I am presenting for CMS is designed to simulate winter conditions and can be applied to the milkweed seed at any time of the year in your home. Winter sowing milkweed seeds is the natural way to break their dormancy. The cycle of freeze and thaw mixed with occasional rain or snow does two things. First, the seeds coat is physically scraped by movement over the dirt. Second, the inner biology is adjusted because the seed has been imbibing water over the winter. Once the warm days arrive in late spring seed is prepared for grow. Planting milkweed seed between Thanksgiving and Christmas is my favorite. It's nice to get the seeds in the dirt before the snow arrives. Casting milkweed seed over the snow leaves them exposed to become the food for small animals. Clean the surface of your counter thoroughly. Take one sheet off your roll of paper towels. Wet the paper towel with cold tap water from the sink. Optionally - Add a drop of dish soap. Reduces mold formation on paper towel. Use one hand to squeeze out all of the water you can from the paper towel. Spread out the paper towel on a clean surface. Evenly scatter the milkweed seeds onto the paper towel. Fold/roll-up the paper towel and seeds. Place the paper towel, now covered in seeds, inside the ziplock bag. Seal the ziplock bag while removing excess air from inside the bag. 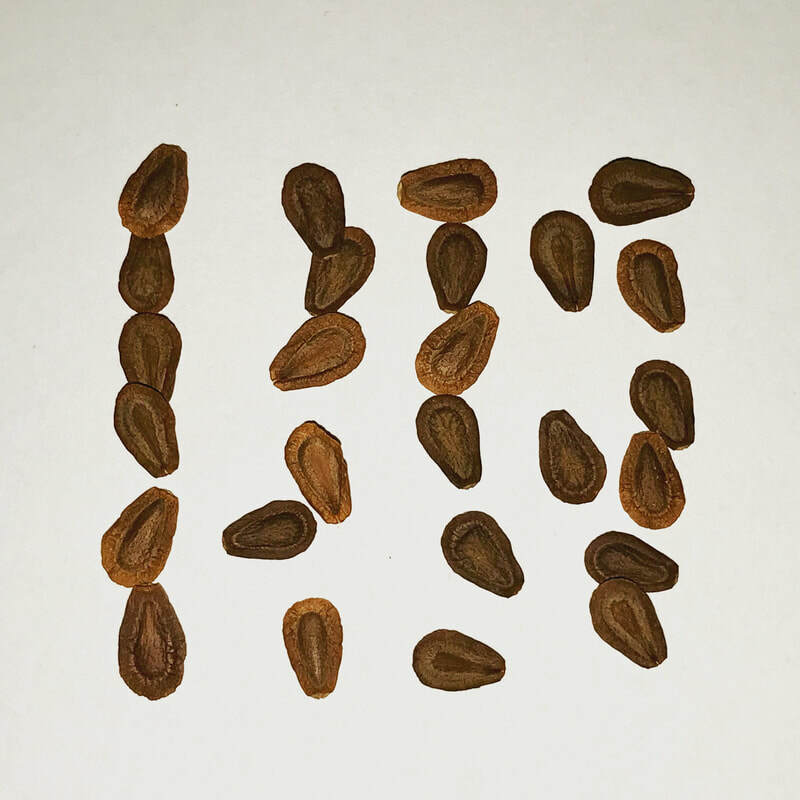 Print the date and seed species on the baggie using a permanent marker. Place the bag in the refrigerator for 40 to 60 days. Set a reminder to retrieve the seeds 40 to 60 days from today. 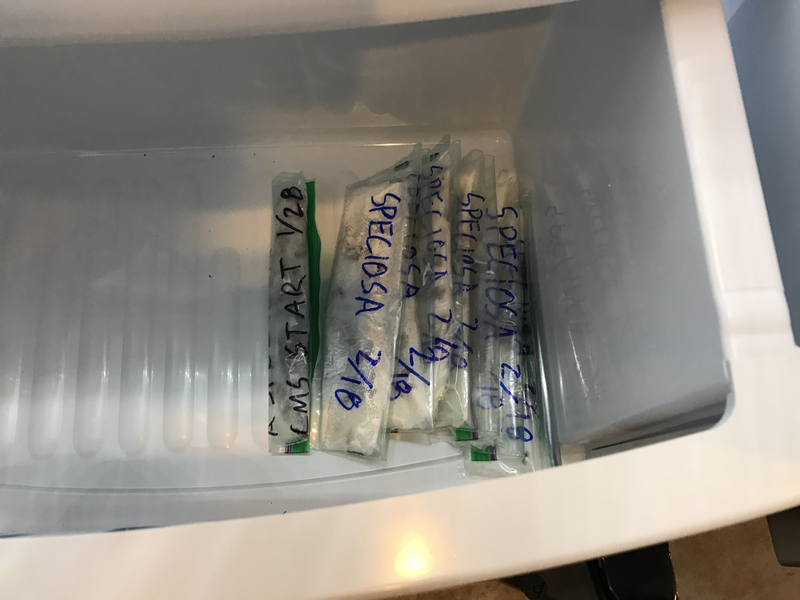 When 40 to 60 days have elapsed, remove the seed bag from the fridge. Leave the seed bag on the counter for 2 to 7 days. Plant the seeds and water daily till they germinate. Download the Cold Moist Stratification .PDF file so you will have it ready when you begin growing milkweed seeds. Repeat success indicates that the process works! On 2/18/17 I prepared seven baggies with showy milkweed seeds. Pictured is midway thru the process. On the left I am in step 7. 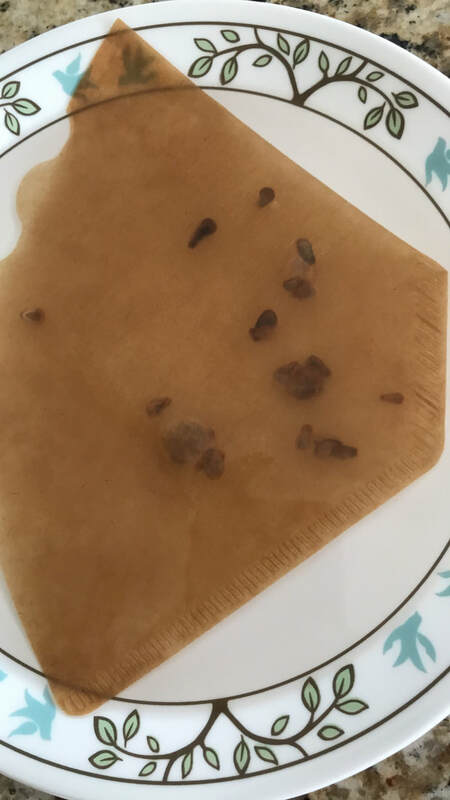 Dormant seeds are spread on the moist paper towel. 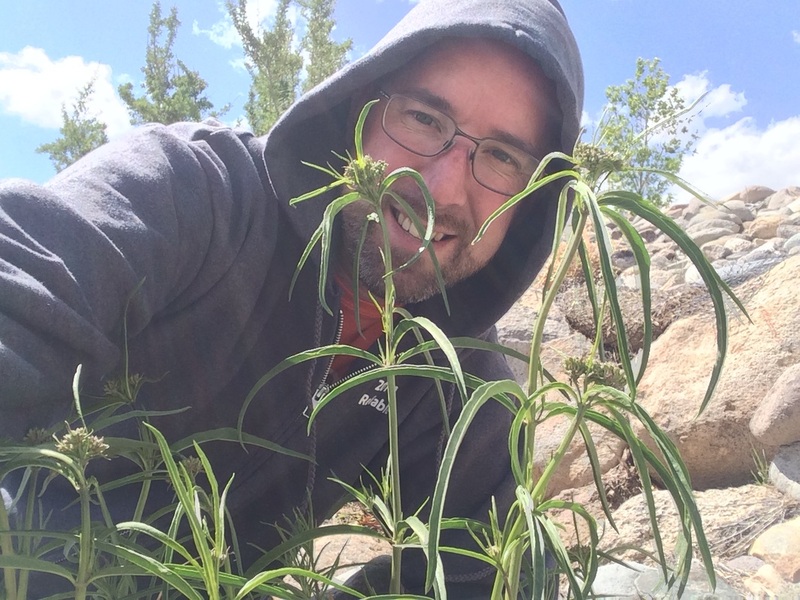 In May 2017 I purchased woollypod milkweed seeds on ebay and began the process of CMS to prepare them to grow. These seeds are really big! The seeds were collected in the fall of 2016 and began dormant. 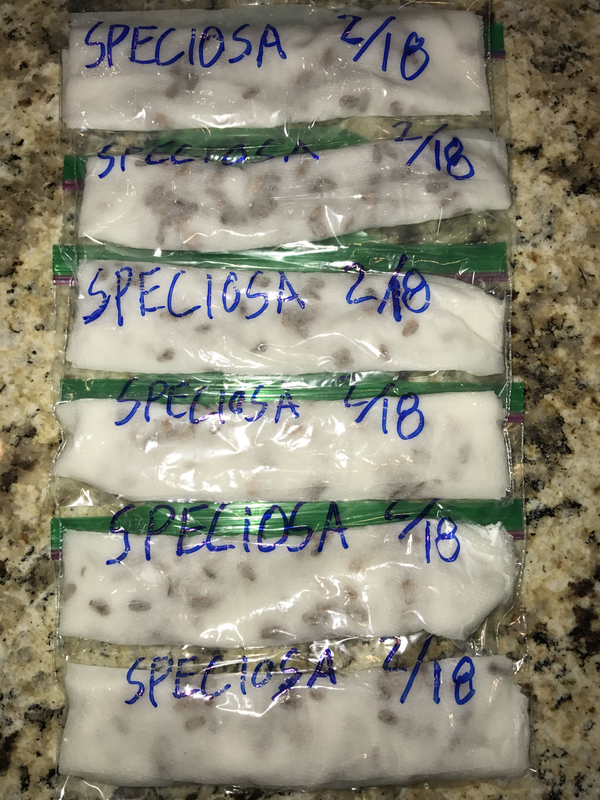 At step 9 the seeds are prepared to go into the refrigerator for 40 to 60 days. Step 14 was hard to wait for. It's not much to look at right now. Exciting biological changes have actually been occurring inside the seed over the last 40 days. Step 12 looks easy. Waiting can be the hardest part. Give the seeds 40 to 60 days in the refrigerator. My fridge has a temperature display on the door. Looks like the seeds are about 37 degrees. Step 15 is pretty cool to see. The seeds are growing right inside the baggie! Time to take the seedlings out of the paper towel and get them in the ground. Some of the seeds root is piercing thru the paper towel. Just pull the towel apart and be careful not to harm the seeds root. Since February for the showy milkweed and May for the woollypod milkweed was to late in the year to winter sow I used the method described above. All and all it worked out great! By August the woollypod milkweed plants were beginning to look like real milkweed. As summer became fall the temperatures outside began to cool off. The sun set a bit lower in the sky and the woollypod milkweed went dormant along with all the other plants. It's December 2017 now and the woollypod milkweed is completely dormant. I have been storing them in the garage for the winter. Hopefully in March of 2018 I will be bring them out to enjoy the warmer weather. 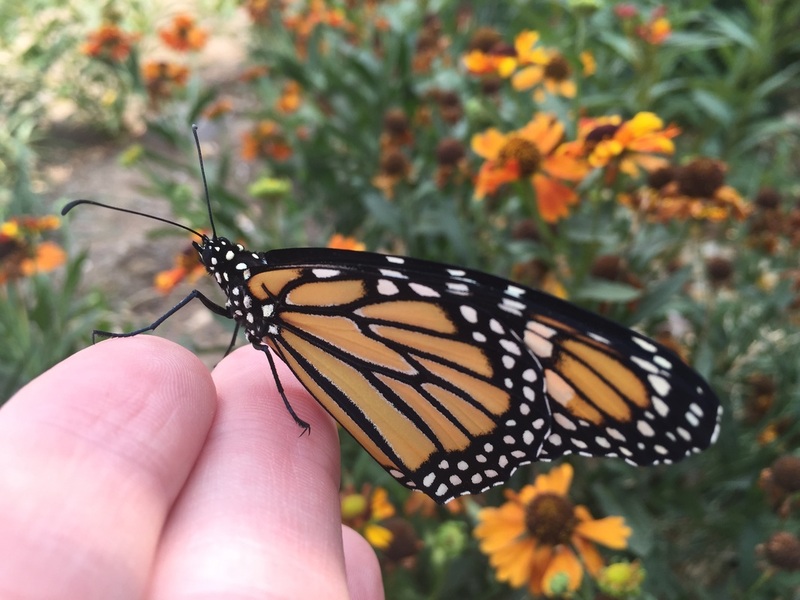 On June 22nd, 2015 I posted a page titled MONARCH BUTTERFLIES ARE EVERYWHERE. At the end of the page I set a goal to raise and release 25 monarch butterflies. 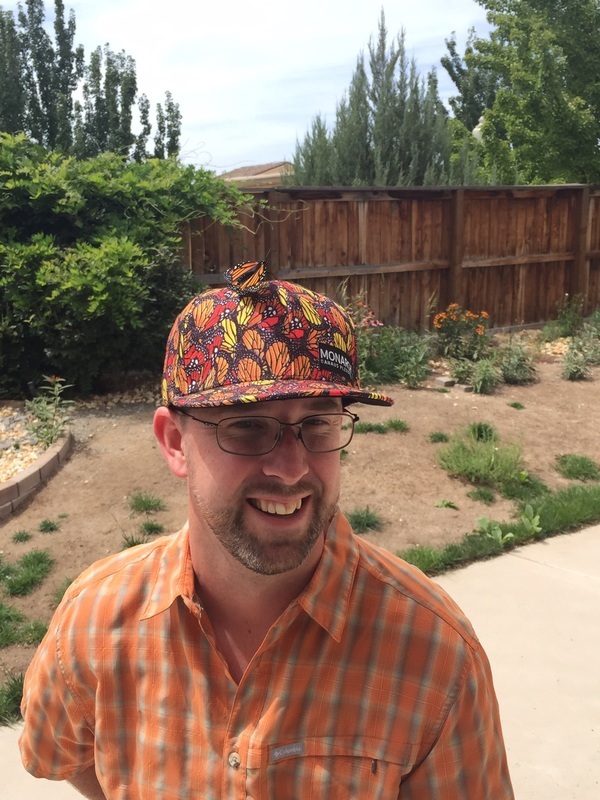 "I set a personal goal to raise 2,500% more monarchs in 2015 than I did in 2014." Did I meet my goal? 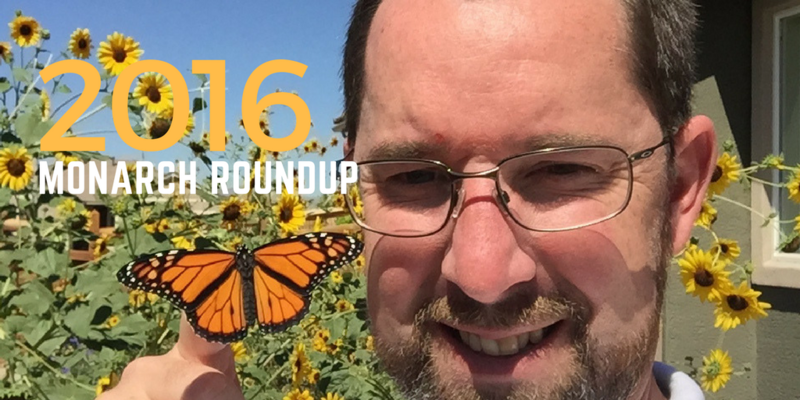 The 2015 Monarch Butterfly Rearing Roundup lets you know how I did at achieving my goal. I couldn't be more satisfied with the results. 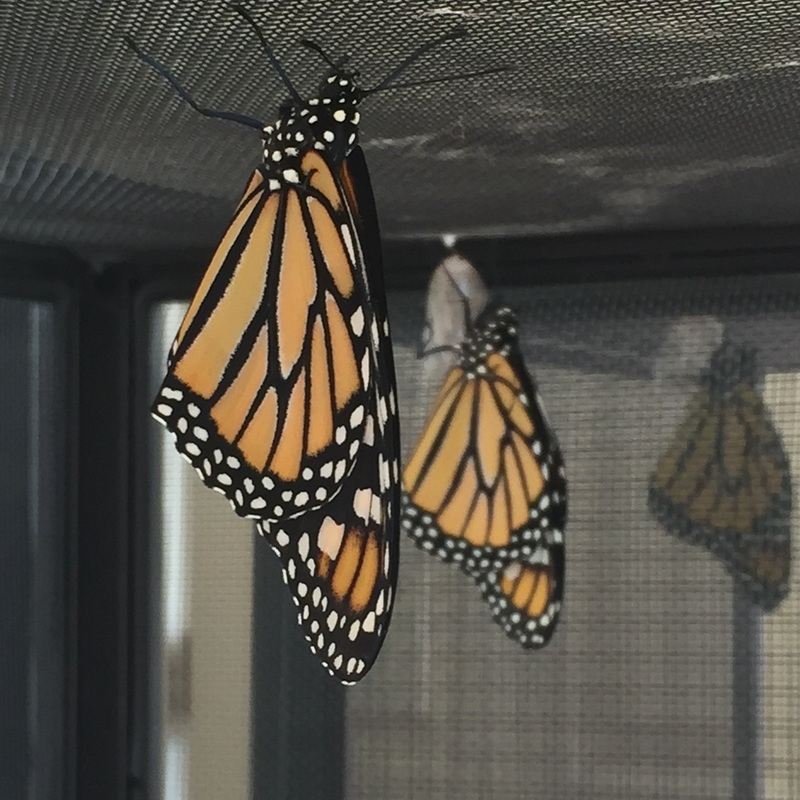 Take a look at the following multimedia about the monarchs I raised in the summer of 2015. 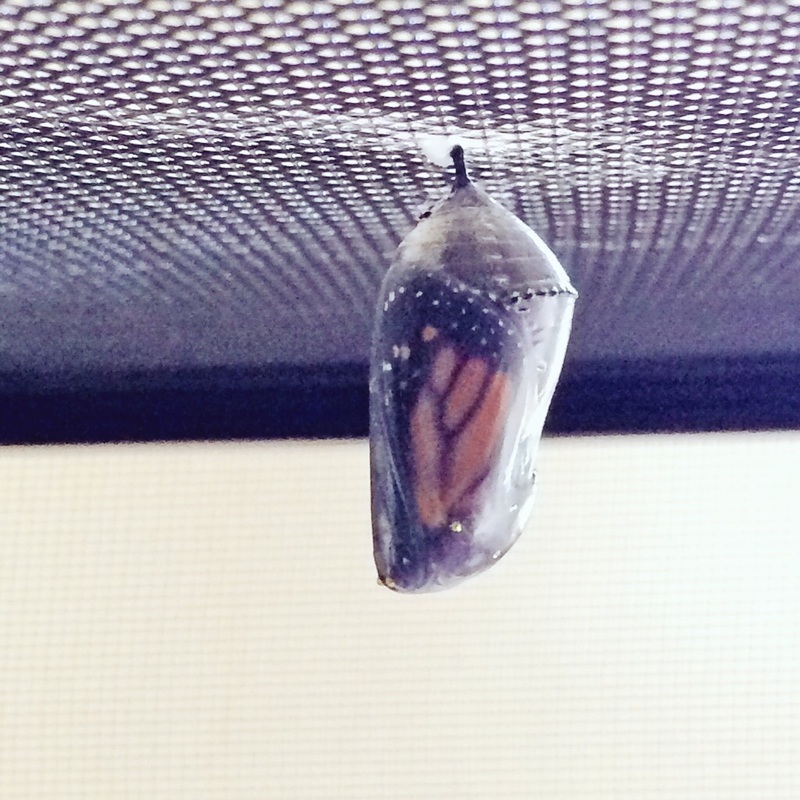 7/10/15 01:50 Chrysalis is nearly clear. Monarch butterfly wings are clearly visible. Monarch is expected to eclose today. Rise and shine! This monarch is ready to eclose any moment. 8/16/15 13:30 Cali is released! 8/7/15 01:00 Cali is hanging in a J-hook :) See photo "2nd J-Hook of 2015"
Cali returns to visit the milkweed 8/17/15 Cali must have know that Diego was being released today. Meet Diego. Born 8/17/15 Diego is part of generation tres. Late August monarchs can be the most popular because they are out mixing it up with flowers and milkweed all day everyday. In 2014 I saw the most monarchs between August 15 and the 30th. I am seeing many monarchs during the same period this year. It is unlikely that Diego will join the migration. It would be really cool to see Diego and Cali both visit me tomorrow. I'm pretty sure I will be releasing another monarch to join them very soon. Eva is a special little monarch. She attached to the vertical wall of the enclosure. A slight tilt to the enclosure helped reduce the pressure on the side of her chrysalis. Eva eclosed at 8:00 8/19/15 Meconium ejected at 8:40. Wings look good! Cliffhanger attached itself to the vertical surface of the enclosures door. I'm glad it chose the door. Before it selected this location I had caught it while it fell during a transition to the ceiling. Had it tried going to the ceiling again I wouldn't have been around to catch it a second time. 8/19/15 Fernando eclosed at 9:30 Meconium ejected at 10:00. Fernando is the second of two new monarchs today. Eva and Fernando seemed inseparable. After they were released they both flew across the yard and landed feet apart in a tree. Following yesterday's release. The butterfly pair both flew across the yard to the same tree. 8/20/15 9:00 new butterfly eclosed. Time-lapse and slow-motion video taken. 8/22/2015 Hurley is the guy on the right in this photo. 8/22/15 Iola is on the left in this photo. Two monarch butterflies released today. A boy and girl. 9/5/15 Katniss eclosed at 12:00. She has been tagged with WSU tag #3009. Meet Katniss. Katniss is now flying around in Northern Nevada. She is looking for other monarch butterflies and milkweed plants. She may even fly to California for the winter. 9/7/15 Leaf eclosed at 10:00. She has been tagged with WSU tag 3010. At 14:00 she was released with photos. 9/11/15 Nancy and Macon flew free together. Nancy was been tagged with WSU tag #2012. She is named after my grandma Nancy. Good chance this flying flower is the mother. She laid numerous eggs on August 17th. 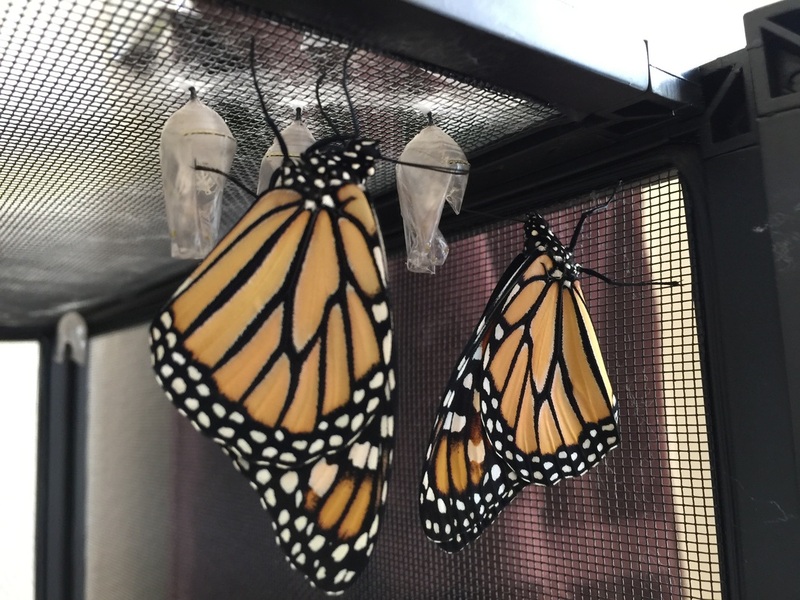 5 MONARCHS RELEASED TODAY! I'll stop yelling now. One female surrounded by four males. It's was a pretty good day. Even got the escrow documents signed for Milkweed Manor, twice. Two days till I move. 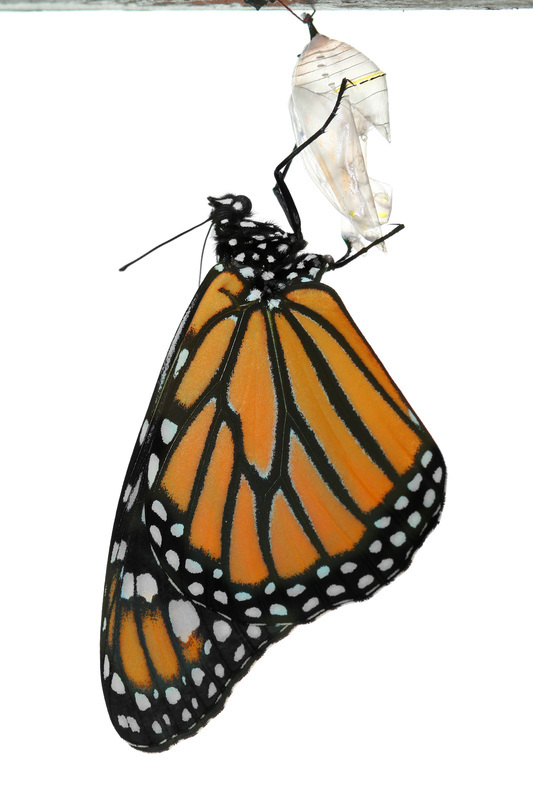 About five monarchs are still being raised for conservation. Brad is a special little butterfly. Brad fell from his silk while attaching his cremaster. I picked him up and attached him to some spare silk then taped him back up. He successfully emerged. Brad is the smallest monarch I have ever released. A small chrysalis makes for a small butterfly. Butterflies do not grow after they emerge. 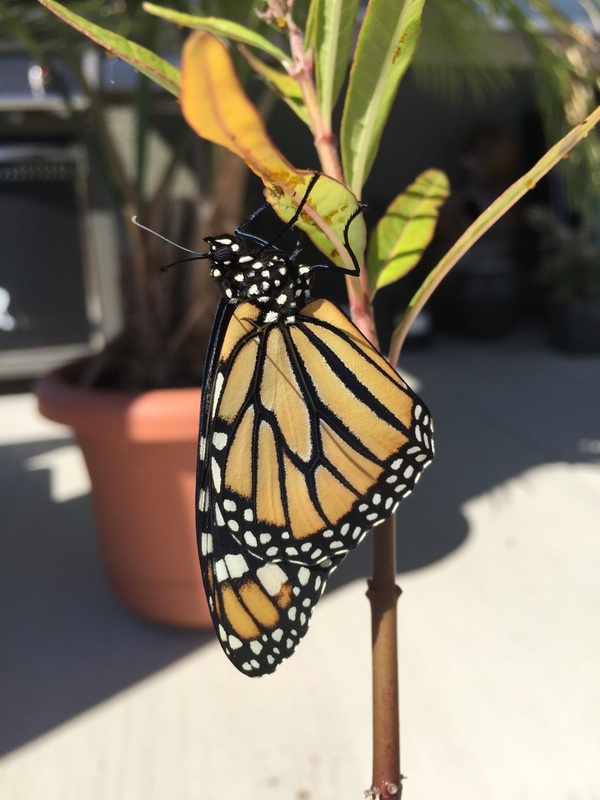 10/08/15 Dean was the last monarch of the 2015 season. Because of the cooler temperatures it took a full fifteen days in the chrysalis for Dean to eclose. 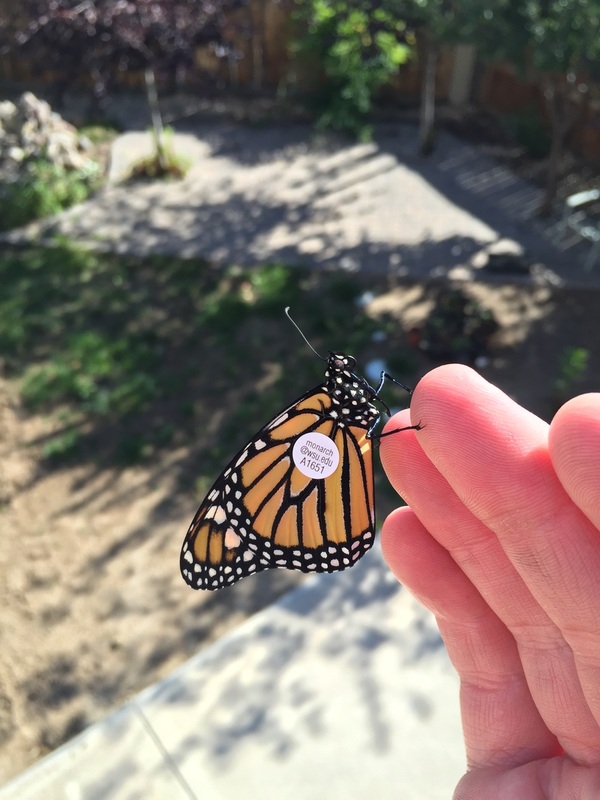 I successfully raised and released twenty-nine monarchs in 2015. I had two fatalities in my care. One first instar caterpillar may have been eaten by a larger caterpillar. Another caterpillar fell ill, leaked green liquid and quickly dissolved into a black liquid. Presumably it was a bacterial infection. That was a tough loss. The difficulities were few and the successes far outweighed them. 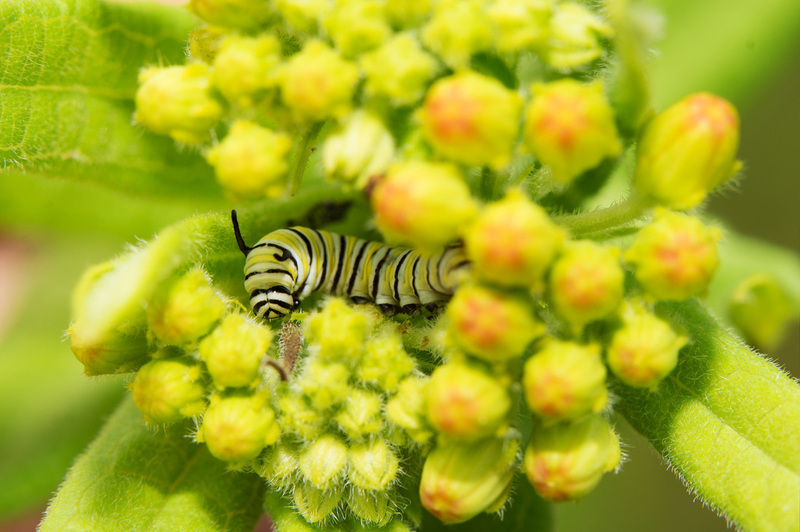 Increasing the amount of milkweed available for monarchs in my yard has created a safe place for them to reproduce. 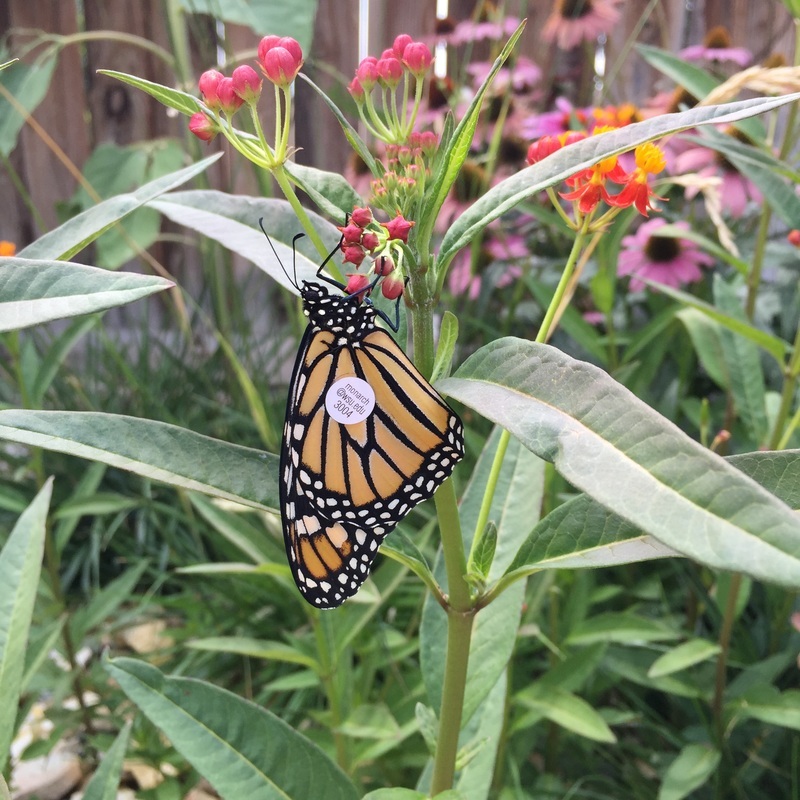 Having a monarch waystation brought the monarchs to the yard throughout the summer months. Last year I was living in a rental home and the yard was not my own. At the end of the season I relocated my potted milkweed to others in the community. The yard is likely to be overhauled with new plants. New for 2016 is my new house, Milkweed Manor. The landscaping in the backyard was a blank slate. A 180 square foot pollinator garden was incorporated into the landscaping. 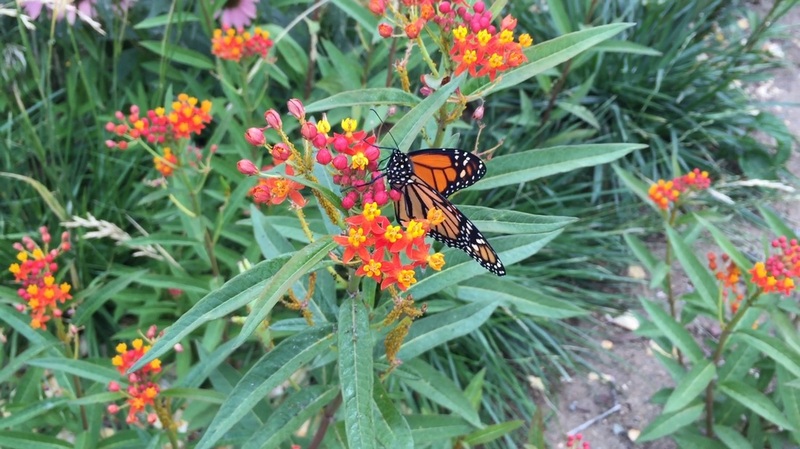 The goal in 2016 is to foster an awareness of milkweed as a favored plant in residential landscaping. By growing native milkweed plants in my own yard I can share the value that the garden has to butterflies, birds and bees. If you are interested in locating native milkweed then please use the Milkweed Locator tool. You are invited to subscribe to this blog to have updates sent to your email.